Publisher Nicalis, accidently revealed some more UI details for the Nintendo Switch. Gaming developer and publisher Nicalis, recently tweeted out a new picture of the Nintendo Switch UI, which shows off what the console looks like in portable mode. Soon after Nicalis tweeted out the image, it was suddenly removed, but not before the great people of the internet managed to grab some screenshots. 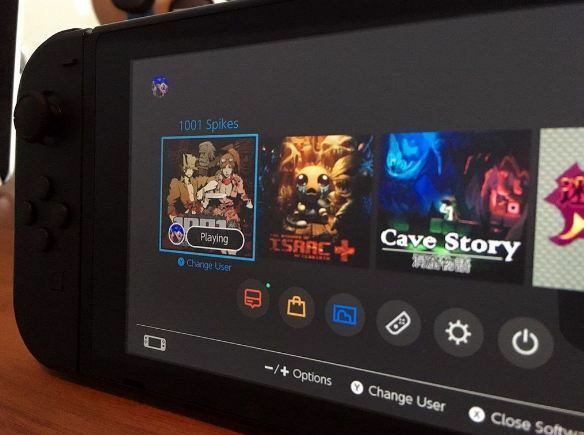 The image shows off three very clear games coming to the Switch, 1001 Spikes, The Binding Of Isaac: Afterbirth+, and Cave Story. In addition to the games, there's also several new features that the picture reveals. The image shows a dark background, which could suggest the Switch may offer dark and light option background and possibly even a more customizable options in the future. In addition, we also get to see a slider for recently played games, setting options, the power button and even a message icon for presumably messages from friends. The Nintendo Switch still has a couple of months to go before its release, so it's entirely possible that the UI could change before it's released. The Nintendo Switch launches on March 3rd for $300.